Maryland is a state located on the East Coast of the United States, in the Mid-Atlantic region, amid the great commercial and population complex that stretches from Maine to Virginia. It is comparable in size to the European country of Belgium. It was the seventh state to ratify the United States Constitution and bears two nicknames, the Old Line State and the Free State. Its geographic location determined its role in U.S. history as a pivot between North and South. Its history as a border state during the Civil War gives it characteristics of both the Northern and Southern regions of the U.S. As a general rule, the rural areas of Maryland, such as Western, Southern, and Eastern Maryland, are more Southern in culture, while densely-populated Central Maryland—areas in the Baltimore and the Washington Beltway Regions—exhibit more Northern characteristics. According to the U.S. Census Bureau, Maryland was the wealthiest state in the country in 2007, with the highest median family income of any state. The state's poverty rate of 7.8 percent was the lowest in the country. Long a major center for federal installations, both military and civilian, it has become a life sciences hub with over 350 biotechnology firms, making it the third-largest such cluster in the nation. The state's population has a disproportionately high educational and economic status. Maryland's topography ranges from sandy dunes dotted with seagrass in the east, to low marshlands teeming with water snakes and large bald cypress near Chesapeake Bay, to gently rolling hills of oak forest in the Piedmont Region, and pine-covered mountains in the west. 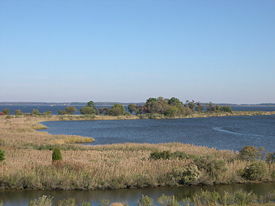 Tidal wetlands of the Chesapeake Bay, largest freshwater estuary in the world and the largest physical feature in Maryland. Maryland is bounded on the north by Pennsylvania, on the west by West Virginia, on the east by Delaware and the Atlantic Ocean, and on the south, across the Potomac River, by West Virginia and Virginia. The mid-portion of this border is interrupted on the Maryland side by Washington, D.C., which sits on land originally part of Maryland. The Chesapeake Bay nearly bisects the state, and the counties east of the bay are known collectively as the Eastern Shore. Most of the state's waterways are part of the Chesapeake Bay watershed, with the exception of a portion of Garrett County drained by the Youghiogheny River, as part of the watershed of the Mississippi River, the eastern half of Worcester County, which drains into Maryland's Atlantic Coastal Bays, and a small portion of the state's northeast corner which drains into the Delaware River watershed. So prominent is the Chesapeake Bay in Maryland's geography and economic life that there has been periodic agitation to change the state's official nickname to the "Bay State," a name currently used by Massachusetts. The highest point in Maryland is Hoye Crest on Backbone Mountain, which is in the southwest corner of Garrett County, near the border with West Virginia and near the headwaters of the North Branch of the Potomac River. In western Maryland, about two-thirds of the way across the state, is a point at which the state is only about 1-mile (2 km) wide. 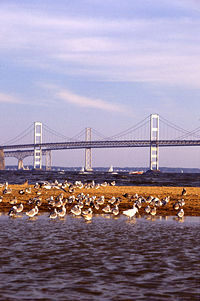 This geographical curiosity, which makes Maryland the narrowest state, is located near the small town of Hancock, and results from Maryland's being bounded on the north by the Mason-Dixon Line and to the south by the north-arching Potomac River. 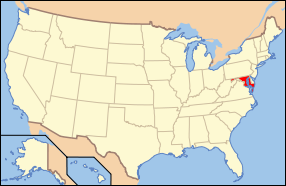 Portions of Maryland are included in a number of official and unofficial geographic regions. For example, the Delmarva Peninsula comprises the Eastern Shore counties of Maryland, the entire state of Delaware, and the two counties that make up the Eastern Shore of Virginia, and the westernmost counties of Maryland are considered part of Appalachia. Much of the Baltimore-Washington corridor lies in the rolling hills of the Appalachian Piedmont. An anomaly of Maryland's geography is that there are no natural lakes, chiefly because the region was not glaciated; nor does it have any significant vulcanism or subsurface faulting. There are numerous man-made lakes, the largest being Deep Creek Lake, a reservoir in Garrett County. The lack of glacial history also accounts for Maryland's soil, which is more sandy and muddy than the rocky soils of New England. Maryland has highly variable regional climates for a state of its size, dependent on many variables, such as proximity to water, elevation, and protection from northern weather due to downslope winds. The eastern half of Maryland lies on the Atlantic Coastal Plain, with very flat topography and very sandy or muddy soil. This region has a humid subtropical climate (Köppen Cfa), with hot, humid summers and a short, mild to cool winter. This region includes the cities of Salisbury, Annapolis, Ocean City, and southern and eastern greater Baltimore. 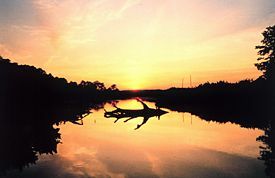 Sunset over a marsh at Cardinal Cove, on the Patuxent River. Beyond this region, the Piedmont lies in the transition between the humid subtropical climate zone and the humid continental climate zone (Köppen Dfa), with hot, humid summers and moderately cold winters where significant snowfall and significant subfreezing temperatures are an annual occurrence. This region includes Frederick, Hagerstown, Westminster, Gaithersburg and northern and western greater Baltimore. Because of its location near the Atlantic Coast, Maryland is somewhat vulnerable to hurricanes, although the Delmarva Peninsula, and the outer banks of North Carolina to the south provide a large buffer, so a strike from a major hurricane (category 3 or above) is not very likely. Maryland gets the remnants of tropical systems that have already come ashore bringing heavy rainfall. The state averages around 30-40 days of thunderstorms and around 6 tornadoes annually. Maryland's plant life is abundant and healthy. High annual precipitation helps to support many types of plants, including seagrass and various reeds at the smaller end of the spectrum to the former giant Wye Oak which fell in June 2002, a large variant of White oak, the state tree that can grow in excess of 70 feet (20 m) tall. Maryland also possesses an abundance of pines and maples among its native trees. Many introduced species are cultivated in the state like the Crape Myrtle, Italian Cypress, and live oak in the warmer parts of the state, and even hardy palm trees in the warmer central and eastern parts of the state. 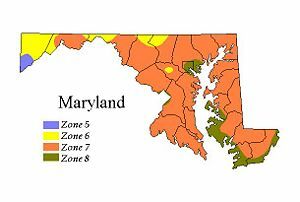 USDA plant hardiness zones in the state range from Zone 5 in the extreme western part of the state to 6 and 7 in the central part, and Zone 8 around the southern part of the coast, the bay area, and most of metropolitan Baltimore. The state harbors a great number of deer, particularly in the woody and mountainous west of the state; overpopulation can become an occasional problem. The Chesapeake Bay provides the state with a huge cash crop of blue crabs, and the southern and eastern portion of Maryland is warm enough to support a tobacco cash crop. Originally hunter-gatherers organized into semi-nomadic bands, they adapted as the region's environment changed, developing the spear for hunting as smaller animals, like deer, became more prevalent by about 1500 B.C.E. With the increased variety of food sources, tribal villages and settlements started appearing and their social structures increased in complexity. Even with the advent of farming, hunting and fishing continued to be major sources of livelihood. The bow and arrow were first used for hunting in the area around the year 800. The indigenous people thrived upon what nature provided. 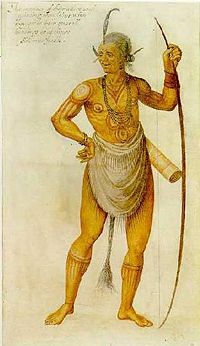 Europeans did not encounter Maryland's indigenous people until the early 1600s, at which time, the main tribes included the Nanticoke on the Eastern Shore, and the Powhatan and the Susquehanna on the Western shore. Within about a century of first contact, the state's Native Americans were all but gone, having been pushed out by the European settlers. The Shawnee were the last major tribe in the state, remaining in Western Maryland until the 1740s. 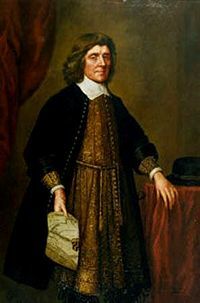 Cecil Calvert, 1st Proprietor of the Maryland colony. On March 25, 1634, Lord Baltimore sent the first settlers into this area. Although most of the settlers were Protestants, Maryland soon became one of the few regions in the British Empire where Catholics held the highest positions of political authority. Maryland was also one of the key destinations of tens of thousands of British convicts. The Maryland Toleration Act of 1649 was one of the first laws that explicitly dictated religious tolerance, although toleration was limited to Trinitarian Christians. The royal charter granted Maryland the Potomac River and territory northward to the fortieth parallel. This proved a problem, because the northern boundary would put Philadelphia, the major city in Pennsylvania, partially within Maryland, resulting in conflict between the Calvert family, which controlled Maryland, and the Penn family, which controlled Pennsylvania. This led to the Cresap's War (also known as the Conojocular War), a border conflict between Pennsylvania and Maryland, fought in the 1730s. A final settlement was not achieved until 1767, when a French survey team established the Mason-Dixon Line, recognized as the permanent boundary between the two colonies. The Puritan revolt lasted until 1658. In that year the Calvert family regained control of the state and re-enacted the Toleration Act. However, after England's "Glorious Revolution" of 1688, when William of Orange and his wife Mary came to the throne and firmly established the Protestant faith in England, Catholicism was again outlawed in Maryland, until after the American Revolutionary War. Many wealthy plantation owners built chapels on their land so they could practice their Catholicism in relative secrecy. During the persecution of Maryland Catholics by the Puritan revolutionary government, all of the original Catholic churches of southern Maryland were burned down. Saint Mary's City was the largest settlement of the original Maryland colony, and was the seat of the colonial government until 1708. Historic St. Mary's City is now an archaeological site, with a small tourist center, with reenactments of the early history annually. In 1708, the seat of government was moved to Providence, which had been renamed Annapolis in 1674 in honor of Queen Anne. 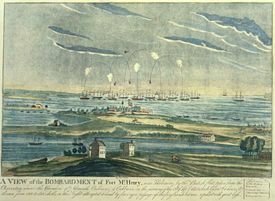 An artist's rendering of the bombardment of Fort McHenry in Baltimore, which inspired the composition of the Star Spangled Banner. Maryland was one of the original thirteen colonies that revolted against British rule in the American Revolution. On February 2, 1781, Maryland became the 13th state to approve the ratification of the Articles of Confederation, creating a sovereign nation which brought into being the United States as a united, sovereign and national state. Maryland also became the seventh state admitted to the U.S. after ratifying the new Constitution. The following year, in December of 1790, Maryland ceded land selected by President George Washington to the federal government for the creation of Washington, D.C.. The land was provided from Montgomery and Prince George's Counties, as well as from Fairfax County and Alexandria in Virginia (though the lands from Virginia were later returned through retrocession). During the War of 1812, the British military attempted to capture the port of Baltimore, which was protected by Fort McHenry. It was during this bombardment that Francis Scott Key, a native Baltimorean, wrote the Star Spangled Banner. Despite widespread support for the Confederate States of America among many wealthy landowners, who had a vested interest in slavery, Maryland did not secede from the Union during the American Civil War. Of the 115,000 men who joined the militaries during the Civil War, 85,000, or 77 percent, joined the Union army. To help ensure Maryland's inclusion in the Union, President Lincoln suspended several civil liberties, including the writ of habeas corpus, an act deemed illegal by Maryland native Chief Justice Roger Taney. He ordered US troops to place artillery on Federal Hill to directly threaten the city of Baltimore. Lincoln also helped ensure the election of a new pro-union governor and legislature. Because Maryland remained in the Union, it was exempted from the anti-slavery provisions of the Emancipation Proclamation, which only applied to states in rebellion. A constitutional convention was held during 1864 that culminated in the passage of a new state constitution on November 1 of that year; Article 24 of that document outlawed the practice of slavery. The right to vote was extended to non-white males in 1867. 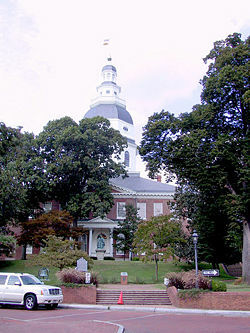 Annapolis is the capital city of Maryland, and the county seat of Anne Arundel County. Settled in 1649 on the south shore of the Severn River by Puritan exiles from Virginia, it was officially incorporated in 1708. It became the temporary capital of the United States after the signing of the Treaty of Paris in 1783. Congress was in session in the Annapolis state house from November 26, 1783, to June 3, 1784, and it was there on December 23, 1783, that General Washington resigned his commission as commander-in-chief of the Continental Army. Annapolis remained the seat of government even after the American Revolution. The United States Naval Academy and St. John's College are in Annapolis. Power in Maryland is divided among three branches of government: executive, legislative, and judicial. The Maryland General Assembly is composed of the Maryland House of Delegates and the Maryland Senate. 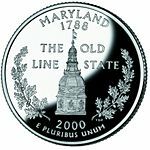 Significant autonomy is granted to many of Maryland's counties, who impose local income tax rates on their residents as high as the state's rate. Most of the business of government is conducted in Annapolis. Virtually all state and county elections are held in even-numbered years not divisible by four, in which the President of the United States is not elected - this, as in other states, is intended to divide state and federal politics. The judicial branch of state government consists of one united District Court of Maryland that sits in every county and Baltimore City, as well as 24 Circuit Courts sitting in each County and Baltimore City, the latter being courts of general jurisdiction for all civil disputes over $25,000.00, all equitable jurisdiction, and major criminal proceedings. The intermediate appellate court is known as the "Court of Special Appeals" and the state supreme court is the "Court of Appeals." 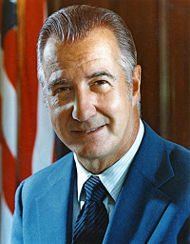 Spiro Agnew, former Vice President of the United States and the highest-ranking political leader in Maryland's history. Since pre-Civil War times, Maryland politics has been largely controlled by the Democrats. Blue-collar "Reagan Democrats" frequently vote Republican, but Maryland is nonetheless well-known for its loyalty to the Democratic Party, especially the metropolitan areas. The state is dominated by the two urban/inner suburban regions of Baltimore and Washington, DC. In addition, many jobs are directly or indirectly dependent upon the federal government. As a result, residents of Baltimore, Montgomery County, and Prince George's County often decide statewide elections. This is balanced by lesser populated areas on the Eastern Shore, Western Maryland, and outer suburbs that tend to support Republicans, even though seven of nine shore counties have Democratic-majority voter rolls. Maryland has supported the Democratic nominee in the last four presidential elections, and by an average of 15.4 percent. In 1980, it was one of six states to vote for Jimmy Carter. In 1992, Bill Clinton fared better in Maryland than any other state except his home state of Arkansas. In 2000, Maryland ranked 4th for Gore and in 2004, John Kerry had his 5th highest percentage in Maryland. Both Maryland Senators and six of its eight Representatives in Congress are Democrats, and Democrats hold super-majorities in the state Senate and House of Delegates. The previous Governor, Robert Ehrlich, was the first Republican to be elected to that office in four decades, and after one term lost his seat to former Baltimore Mayor Martin J. O'Malley, a Democrat. While Maryland is a Democratic party stronghold, its best known political figure may be former Republican Governor Spiro Agnew, who served as US Vice President under Richard Nixon from 1969 to 1973. He resigned in 1973, in the aftermath of revelations that he had taken bribes while he was Governor of Maryland. In late 1973, a court found Agnew guilty of violating tax laws. The late Supreme Court Justice Thurgood Marshall was raised in Baltimore, and during his time on the bench led the liberal wing of the court. Maryland's economic activity is strongly concentrated in the tertiary service sector, and this sector, in turn, is strongly influenced by location. One major service activity is transportation, centered around the Port of Baltimore and its related rail and trucking access. The port ranked 10th in the US by tonnage in 2002. Although the port handles a wide variety of products, the most typical imports are raw materials and bulk commodities, such as iron ore, petroleum, sugar, and fertilizers, often distributed to the relatively close manufacturing centers of the inland Midwest via good overland transportation. The port also receives several different brands of imported motor vehicles. A second service activity takes advantage of proximity to the center of national government in Washington, D.C., emphasizing technical and administrative tasks for the defense/aerospace industry and bio-research laboratories, as well as staffing of satellite government headquarters in the suburban or exurban Baltimore/Washington area. There are also many educational and medical research institutions located in Maryland. Johns Hopkins University and its medical research facilities are the largest single employer in the Baltimore area. Altogether, white collar technical and administrative workers comprise 25 percent of Maryland's labor force, one of the highest state percentages in the country. Maryland has a large food-production sector, including a significant commercial fishing industry, based in Chesapeake Bay, with a smaller fishery off the Atlantic seacoast. The largest catches by species are the blue crab, oysters, striped bass, and menhaden. The Bay also has uncounted millions of overwintering waterfowl in its many wildlife refuges, supporting a tourism sector of sportsmen. 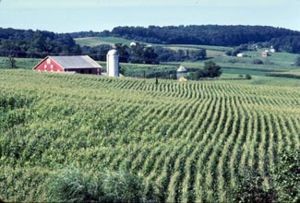 Maryland has large areas of fertile agricultural land in its coastal and Piedmont zones, although this land use is being encroached on by urbanization. Agriculture is oriented to dairying (especially in foothill and piedmont areas) for nearby large city milksheads plus specialty crops, such as cucumbers, watermelons, sweet corn, tomatoes, muskmelons, squash, and peas. In addition, the southern counties of the western shoreline of Chesapeake Bay have supported a tobacco cash crop zone since early Colonial times but that has declined greatly after a state government buyout in the 1990s. There is also a large automated chicken-farming industry in the state's southeast; Salisbury is home to Perdue Farms. Manufacturing, while large in dollar value, is highly diversified with no sub-sector contributing over 20 percent of the total. Typical forms of manufacturing include electronics, computer equipment, and chemicals. The extensive primary metals sub-sector that at one time included what was the largest steel factory in the world at Sparrows Point, still exists, but has contracted with foreign competition, bankruptcies, and company mergers. During World War II, the Glenn L. Martin Company (now part of Martin Marietta airplane factory near Essex, MD) employed some 40,000 people. Mining is essentially limited to coal in the mountainous western part of the state. The brownstone quarries in the east, which gave Baltimore and Washington much of their characteristic architecture in the mid-1800s, were once an important natural resource. Historically, there were once small gold-mining operations in Maryland, some surprisingly near Washington, but these no longer exist. Maryland imposes four income tax brackets, ranging from 2 percent to 4.75 percent of personal income. The city of Baltimore and Maryland's 23 counties levy local "piggyback" income taxes at rates between 1.25 percent and 3.2 percent of Maryland taxable income. Local officials set the rates and the revenue is returned to the local governments quarterly. Maryland's state sales tax is 5 percent. All real property in Maryland is subject to the property tax. Generally, properties that are owned and used by religious, charitable, or educational organizations or property owned by the federal, state or local governments are exempt. Property tax rates vary widely. No restrictions or limitations on property taxes are imposed by the state, meaning cities and counties can set tax rates at the level they deem necessary to fund governmental services. These rates can increase, decrease or remain the same from year to year. If the proposed tax rate increases the total property tax revenues, the governing body must advertise that fact and hold a public hearing on the new tax rate. This is called the Constant Yield Tax Rate process. Baltimore City is the eighth largest port in the nation, and was at the center of the February 2006 controversy over the Dubai Ports World deal because of its strategic importance. The state as a whole is heavily industrialized, with a booming economy and influential technology centers. Its computer industries are some of the most sophisticated in the United States. Maryland is home to several large military bases, including Andrews Air Force Base, and Camp David, the presidential retreat, and thousands of high level government jobs. Maryland's largest airport is Baltimore-Washington International Thurgood Marshall Airport (BWI). The only other airports with commercial service are at Hagerstown and Salisbury. Amtrak trains out of Union Station in Washington, DC serve Baltimore's Penn Station, BWI Airport, New Carrollton, and Aberdeen along the Northeast Corridor. In addition, train service is provided to Rockville and Cumberland on the Amtrak Capitol Limited. MARC commuter trains, operated by the State's Transit Authority, connect nearby Washington, D.C., Frederick, Baltimore, and many towns between. The Washington Metro subway and bus system serve Montgomery County and Prince George's County. The Maryland Transportation Authority's light rail and short subway system serve Baltimore City and adjacent suburbs. The public primary and secondary education is overseen by the Maryland State Department of Education. The highest educational official in the state is the State Superintendent of Schools appointed by the State Board of Education to a four-year term of office. The Maryland General Assembly has given the Superintendent and State Board autonomy in educationally-related decisions, limiting its own influence on the day to day functions of public education. Each county and county-equivalent in Maryland has a local Board of Education charged with running the public schools in that particular jurisdiction. 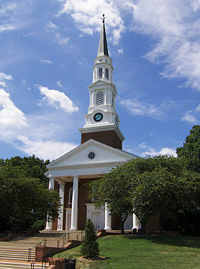 The oldest college in Maryland, and the third oldest college in the United States, is St. John's College, founded in 1696 as King William's School. Maryland has 18 other private colleges and universities, the most prominent of which is Baltimore's Johns Hopkins University, founded in 1876 with a grant from Baltimore entrepreneur Johns Hopkins. The first and largest public university in the state is the University of Maryland, College Park, which was founded as the Maryland Agricultural College in 1856 and became a public land grant college in 1864. The majority of public universities in the state are affiliated with the University System of Maryland. Two state-funded institutions, Morgan State University and St. Mary's College, as well as two federally-funded institutions, the Uniformed Services University of the Health Sciences and the United States Naval Academy are not affiliated with the University of Maryland system. 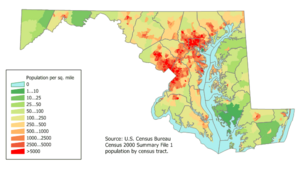 The majority of Maryland's population is concentrated in the cities and suburbs surrounding Washington, DC and Maryland's most populous city, Baltimore. Historically, these cities and many others in Maryland developed along the fall line, the point at which rivers are no longer navigable from sea level due to the presence of rapids or waterfalls. Maryland's capital, Annapolis, is one exception to this rule, lying along the Severn River close to where it empties into the Chesapeake Bay. The eastern, southern, and western portions of the state tend to be more rural, although they are dotted with cities of regional importance such as Salisbury and Ocean City on the eastern shore, Waldorf and La Plata in southern Maryland, and Cumberland in Western Maryland. As of 2006, Maryland had an estimated population of 5,615,727, which was an increase of 26,128, or 0.5 percent, from the prior year and an increase of 319,221, or 6.0 percent, since the year 2000. This includes a natural increase since the last census of 189,158 people (that is 464,251 births minus 275,093 deaths) and an increase due to net migration of 116,713 people into the state. Immigration from outside the United States resulted in a net increase of 129,730 people, and migration within the country produced a net loss of 13,017 people. Most of the population of Maryland lives in the central region of the state, in the Baltimore Metropolitan Area and Washington Metropolitan Area, both of which are part of the Baltimore-Washington Metropolitan Area. The Eastern Shore is less populous and more rural, as are the counties of western and southern Maryland. The two counties of Western Maryland (Allegany, Garrett), are mountainous and sparsely populated, resembling West Virginia more than the rest of Maryland. Although the African American proportion of the population is not as high as it was during the eighteenth century peak of tobacco plantation production (when it was 38 percent), Maryland still has the largest black population of any state outside of the Deep South. Maryland also has the second largest Korean American population, trailing only Texas. In fact, 1.7 percent are Korean, while as a whole, almost 6.0 percent are Asian. The most widely reported ancestries in Maryland are African-American (29.02 percent), German (15.7 percent), Irish (11.7 percent), English (9 percent), Hispanic (6 percent), unspecified American (5.8 percent), and Italian (5.1 percent). Maryland has one of the largest proportions of racial minorities in the country. Maryland was founded by First Lord Calvert's family for the purpose of providing religious toleration of England's Catholic minority. Nevertheless, the British Parliament later reversed that policy and discouraged the practice of Catholicism in Maryland. Despite the founding intent of the colony, Catholics have never been in a majority in Maryland since early Colonial times. Despite the Protestant majority, Maryland has been prominent in US Catholic tradition, partially because it was intended by George Calvert as a haven for English Catholics. Baltimore was the location of the first Catholic bishop in the U.S. (1789), and Emmitsburg was the home and burial place of the first American-born citizen to be canonized, Saint Elizabeth Ann Seton. Georgetown University, the first Catholic University, was founded in 1789 by the Jesuit Order in what was then part of Maryland, though it became a part of the District of Columbia when it was created in the 1790s. Due to the presence of two major metropolitan areas in the state, those surrounding Washington, D.C. and Baltimore, Maryland has a number of major and minor professional sports franchises. Two teams of the National Football League play in Maryland, the Baltimore Ravens in Baltimore and the Washington Redskins in Prince George's County. The Baltimore Orioles are the Major League Baseball franchise in the state. The National Hockey League's Washington Capitals used to play in Maryland until the construction of a new Washington-based arena in 1997. Lacking a National Basketball Association franchise, many Maryland residents are fans of the Washington Wizards. There are also a number of smaller sports franchises in the state, including five minor league baseball teams. ↑ Maryland Facts. Maryland Office of Tourism. Retrieved June 2, 2009. ↑ Population and Housing Unit Estimates. U.S. Census Bureau (June 22, 2017). Retrieved June 22, 2017. ↑ American FactFinder, United States Census Bureau. U.S. Census Bureau, September 29, 2010. Factfinder.census.gov. Retrieved October 24, 2010. ↑ 4.0 4.1 Elevations and Distances in the United States. United States Geological Survey (2001). Retrieved October 21, 2011. ↑ Maryland Geological Survey. January 24, 2007. Maryland’s Lakes and Reservoirs Retrieved December 26, 2007. ↑ Tufts University Initiative for the Forecasting and Modeling of Infectious Diseases. seasonality Retrieved December 26, 2007. ↑ National Oceanic and Atmospheric Administration. Maryland Annual Average Snowfall Map Retrieved December 26, 2007. ↑ ''National Oceanic and Atmospheric Administration - Climatic Data Center.Annual average number of tornadoes map Retrieved December 26, 2007. ↑ Dennis C. Curry, July 1996. Maryland Petroglyphs Maryland Historical Trust. ↑ Jefferson Patterson Park and Museum. Archaeology Retrieved December 26, 2007. ↑ Wayne Clark, John Smith's Chesapeake Voyages, 1607-1609. Maryland Historical Trust. Retrieved December 26, 2007. ↑ Maryland State Archives. June 17, 2004. Maryland at a Glance.Maryland archives. Retrieved December 26, 2007. ↑ History St. Mary's City  stmaryscity.org. Retrieved June 1, 2008. ↑ U.S. Department of Commerce - Bureau of Economic Analysis. Gross Domestic Product (GDP) by State, 2005 Retrieved December 26, 2007. ↑ Association of Baltimore Area Grantmakers. The State of Individual Giving in Maryland - 2005. Retrieved December 26, 2007. ↑ U.S. Census Bureau. 2007 American Community Survey. Retrieved December 26, 2007. ↑ N.C. Aizenman, and Christopher Lee. August 29, 2007. U.S. Poverty Rate Drops; Ranks of Uninsured Grow washingtonpost.com. Retrieved December 26, 2007. ↑ U.S. Army Corps of Engineers. Waterborne Commerce Statistics Center. Retrieved December 26, 2007. ↑ MD Department of Business and Economic Development. Education in Maryland Retrieved December 26, 2007. ↑ Brinton Turner. April 5, 2006. Immigration Bill Could Impact Maryland.Capital News Service. Retrieved December 26, 2007. This page was last modified on 1 November 2018, at 14:56.